When you’re counting calories, the phrase “one lump or two?” takes on new meaning. The number of calories in a cup of tea depends on the amount of sugar and milk that you add. The tea itself adds a mere 2 calories, and does not vary significantly between varieties. The carbohydrates in tea come almost entirely from added sugar. One teaspoon of sugar contains 16 calories, all of which can be attributed to sucrose. Adding 1 tbsp. of milk to your tea will give you an additional gram of carbohydrate, all of which comes from lactose, otherwise known as milk sugar. Don't put too much sugar in your tea -- sugar can raise your levels of triglycerides, which, according to Dr. Howard N. Hodis of the University of Southern California, can raise the risk of heart disease. By itself or with sugar, tea contains no fat. Add 1 tablespoon of 2 percent milk and you’ll add 8 calories and approximately 1/3 gram of fat. Whole milk will add a couple more calories and an insignificant amount of extra fat. If you make lattes with your tea, using 1 cup of 2 percent milk, you’ll add 120 calories and 5 grams of fat. Tea is a healthy beverage that is appropriate to sip throughout the day. Tea contains catechins, a type of flavonoid that has cancer-fighting properties, according to Harvard Medical School. Tea’s flavonoids can also lower bad cholesterol. Fresh green tea has the highest concentration of these antioxidants, but black tea is healthy as well. 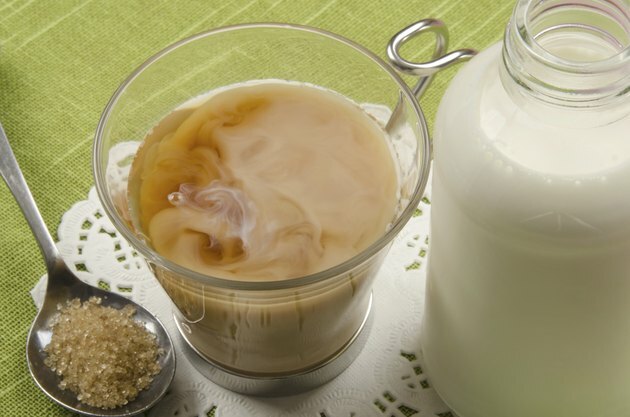 If you drink tea several times a day, you may negate some of the health benefits if you add sugar and whole milk. Besides adding 16 calories per teaspoon, sugar can negatively affect blood sugar levels, promote obesity and affect triglycerides. You can also significantly increase your caloric load over the day, as 5 cups of tea containing 2 teaspoons of sugar each will add an additional 160 calories. Add an ounce of whole milk to those 5 cups, and you’ll add yet another 90 calories and 5 grams of fat. Eliminate many of the extra calories that sweetened tea can add to your diet by substituting a low-calorie sweetener such as stevia for the sugar. Use nonfat milk if you sip multiple cups of tea with added milk. If you can’t stomach the idea of not using real sugar, consider adding less and less sugar to your tea over time, which will retrain your sweet tooth to be satisfied with less sweetness. University of Southern California: So Long, Sugar! How Many Calories Are in a Cup of Tea With Milk? How Many Calories Does a Chai Tea Latte Have? Does Adding Cream & Sugar Cancel the Health Benefits of Tea? How Many Calories Are in a Cup of Tea With Two Sugars? How Many Carbohydrates in a 6-Ounce Glass of Tea?